Here is an important update for the candidates who are going to participate in NEET-PG Second Round of Counseling. Subsequent to the dismissal of Writ Petition 6169 of 2018 of Hon’ble High Court of Madras, the second round of counseling is now resumed. Candidates are now advised to report to the allotted centres for admission procedure. Go through the official notification here. 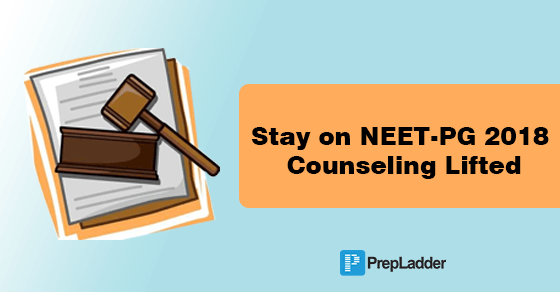 It is further informed that all NEET-PG candidates who were allotted a seat in the first round of counseling but did not get upgraded in second round that the last date of Online/ Offline Resignation is by 19th April,2018 if they don’t want to continue with it. If a candidate does not resign from his/ her allotted seat within the stipulated time, it will be assumed that he/she is interested in the allotted seat and joined as 2nd round candidate and the rules of 2nd round joined candidate will be applicable on them. The reason cited for this stay is a petition by Tamil Nadu in service candidates demanding incentive marks and 50% reservation in the state counseling. Some petitions however also demanded reservation in the national counseling. When the pleas came up for hearing, assistant solicitor-general Karthikeyan submitted that though first phase of counseling had been completed admissions would not be made till the court passed final orders.